Pack the car and head to Stowe! We will have the warm cookies and jacuzzi tub waiting at the end of your day on the mountain. Double-sided fireplaces in each guestroom and delicious sunlit breakfasts! When the resort life just isn’t for you, get away from it all, while still enjoying easy access to all of Stowe’s best slopes. We’re located minutes away from downtown Stowe and the Mountain. Did you know Stowe is one of the WORLD’S Best Ski Towns for Foodies? Fodor’s Travel named Stowe, Vermont #2 in a round-up of the World’s Top 10 Ski Towns for Foodies. You’ll have to go to France, to do better! Yum!!! My advice is to stop searching for a B&B, just stay at the wonderful Stone Hill Inn. 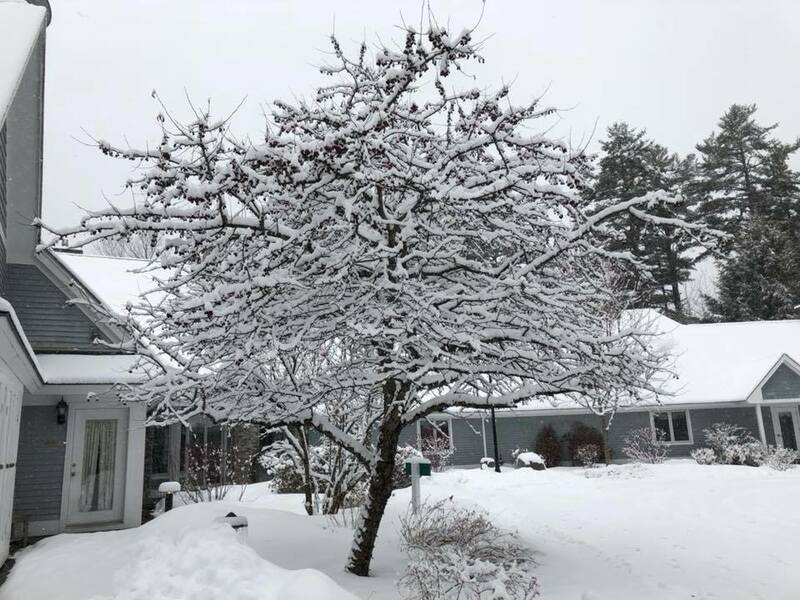 Traveling to a snowy destination in winter was our desire and we were thrilled with the snow upon arrival in Burlington. 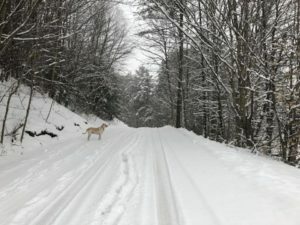 It is about a one hour drive to Stowe. A bit more in the snow storm. The enterance is well marked. Todd was there to greet us and show us the amenities of the Stone Hill Inn. Our room, as do the others had a 2 sided fireplace between the bedroom and bathroom. It quickly took the chill out of the air. Very comfortable king size bed and Linens. We stayed 4 nights. At breakfast Todd was the chef and Kristi the host. Their care was supplemented by a great guy, Tony. His job waiter, housekeeper and tour guide. After visiting for 15 minunets, returned with a map and suggested activities for the day. In the meantime Todd prepared a great breakfast, alternating between sweet and savory, (French Toast, breakfast tacos, pancakes and omelette). There were also pastries and fruit. As we finished breakfast Todd and Kristi checked on us, and gave more recommendations to enjoy Stowe. They also set up dinner reservations and a sleigh ride. We also enjoyed the scenery and landscape. Great view from our room. 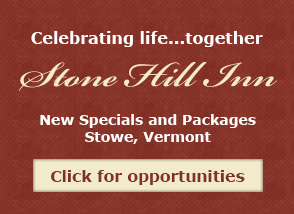 We look forward to hosting you at the Stone Hill Inn. Stone Hill Inn is the perfect Stowe mountain lodging choice for hitting the mountain and then retreating to quiet, luxury. There’s a reason Yankee Magazine voted us “Best Romantic Getaway in New England.” Book your Winter or Spring stay today and find out for yourself. We know you won’t be disappointed! Call us to book your romantic getaway today (802) 253-6282 or book online. Romance is always in season! Having survived Minnesota for 23 years, I promised myself when we moved back to PA that I would avoid residences with climates that dominate your life; i.e. a six-month winter. Besides the emotional “stir-craziness,” they impose upon its denizens, they are especially hard on the golf game. Not that golf needs to be the center of existence, but when you visit old friends that live in Florida or San Diego and try to compete with their year-round play, you often come out on the short end of the contest. Today, I still enjoy golf, but two things have changed: (1)Despite my promise, I have returned to a very NORTHERN climate, so I’m back on the six-month program; and (2) in my aging years I’ve found something I enjoy as much and often more than golf: gardening. Having passed the Penn State gardening course back in 2007, a little knowledge has encouraged me to literally ‘dig in,’ such that I often find myself losing track of time while getting my hands dirty! I love it! That’s what this note is about. So, let’s talk gardening. Stowe, Vermont – Zone 4. This is a definite contrast to PA — Zone 6 — where a mild climate allows you to grow darn near anything. After almost three years I’m still learning Vermont plants, and surprising to me, (given 20 below winters with six to ten feet of snow each year) many are striking. As an example, this plant (pictured), is one that I find to be exquisite – one of the most spectacular that I’ve ever seen (short of some of the Longwood Garden orchids located just outside of Philly). This is currently blooming in our gardens. 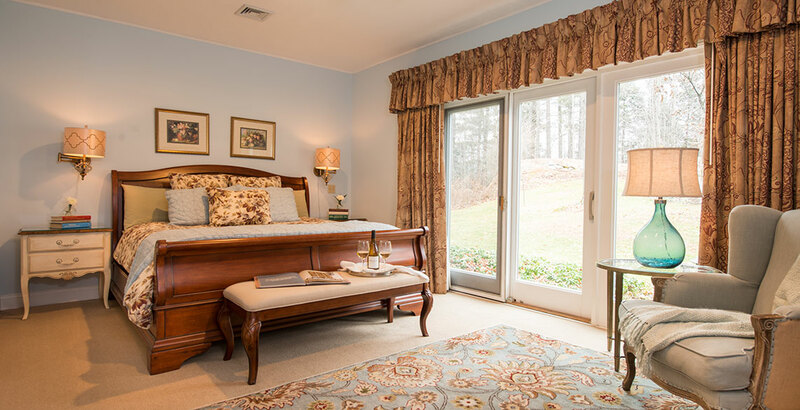 Each of our guest rooms has a sliding glass door that allows them to walk directly into the back yard and explore the perennial gardens along with the man-made, 80’ path of streaming water lined by blooming flowers that ends with a three foot drop into a small pond. The objective of these gardens is to mirror the luxury found throughout the inn and its guest rooms. Plus, the gardens provide locations where beauty overcomes everyday concerns, thus, naturally encouraging romance! Yea! Do you know this plant? Isn’t it beautiful? It is part of a small genus of flowering plants in the Iris family, Iridaceae. It is native to the grasslands of the Cape Floristic Region, South Africa. 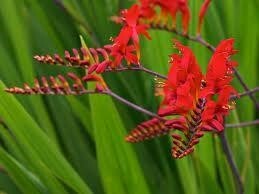 They can be evergreen or deciduous perennials that grow from basal underground corms. Ours are deciduous. Do you know its name? Let me know if you think you can identify it. We have many noteworthy plants in the gardens. Gooseneck Loosestife (white) is very stunning but it is nearly invasive (the purple version of Loosestrife had been declared an outlaw in MN because it is so invasive and loves water — MN has 10,000 lakes!) Because their blooms last a long time we will occasionally use the white Loosestrife among the daily flowers that adorn the dining room tables for breakfast. However, because it’s so aggressive and has taken over too much territory, this Fall I will dig several hundred of these plants. Hopefully some will find a home with other gardeners. No doubt you’re aware of Heliopsis helianthoides? Me neither. Stone Hill was the first time I had ever seen them. Early bloomers, they light up the garden with a blanket of at least a hundred square feet with brilliant yellow flowers. They last for about two weeks and when not blooming are comfortable taking over new territory in the garden via rhizomes. They aren’t cutting flowers. Rudbeckia looks like daisies; also called coneflowers or black-eyed-susans. We’ve got a bunch of them – and in groups of several hundred they are impressive – a sea of joy and energy. About 2-3 feet in height, yellow-gold and they last for weeks. We often use them in the dining room. There’s tons more, but you get the idea. 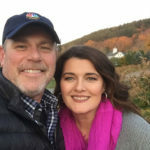 Try to imagine the luxury of enjoying Baptisa, Euporbia, Lysimachia, Weigela and a dozen other species that make the gardens at Stone Hill Inn a delightful romantic encounter! Oh you can bring your gloves if you want!